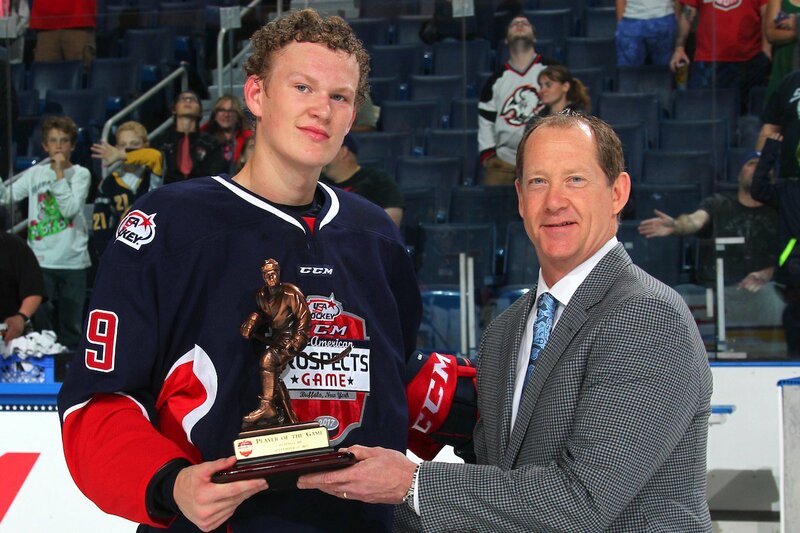 Freshman Brady Tkachuk scored the game-winner with five minutes left in regulation to give Team Leetch a 6-5 win over Team Chelios in the 2017 CCM All-American Prospects Game in Buffalo. The 6’3” left wing, who also had an assist, led a rush into the offensive zone, left the puck for linemate Christian Krieger and converted a return pass on a one-timer from the right circle. The 6’3” left wing, who also recorded an assist, earned Player of the Game honors. In the second period, after 2018 recruit Joel Farabee assisted on Oliver Wahlstrom’s goal to bring Team Chelios even at 2-2, Tkachuk and 2018 recruit Jake Wise set up Blake McLaughlin for a 3-2 Team Leetch lead. Tkachuk also led all players with five shots on goal. The third future Terrier in the game was Tyler Weiss, who skated for Team Chelios. "He's a pretty complete package. He can play and be impactful in every situation, with and without the puck. If you need a goal, he'll go out and get a goal-scoring chance. If you're protecting a lead, he'll be responsible defensively. If you need someone to go in there and maybe throw their weight around a little bit, let the other team know we won't be pushed around, he's a guy that steps up and he seems to rise to those occasions." ► Tkachuk is the second Terrier to be named Player of the Game at the AAPG. Jack Eichel did so in 2014. Sophomore Jake Oettinger and freshmen Logan Cockerill and David Farrance played in the All-American Prospects Game in Philadelphia. ► As Oettinger did last season, Tkachuk is writing a season-long draft diary for NHL.com. His initial entry is here. Terrier’s begin their 2017-18 campaign with an exhibition contest against Concordia University with puck drop set for 7 p.m. at Walter Brown Arena. As Head Coach Brian Durocher begins his 13th season behind the bench, BU is led by senior Victoria Bach (photo), a unanimous Hockey East first-team All-Star with 49 points last season, and classmates, Maddie Elia (36 points), Captain Rebecca Leslie (34) and Nina Rodgers (31). Senior Erin O’Neil returns between the pipes. BU plays its first regular-season game and first Hockey East contest tomorrow night, hosting Merrimack. ●GoTerriers.com preview, Game notes, Live Stats, TerrierTV live stream.